The good people of Winnipeg have spoken and we listened. After reviewing feedback from our most valued customers, Bad Axe Throwing Winnipeg has decided to chop more than just wood—we’ve chopped the price of our axe throwing sessions. This means you can enjoy chucking blades at wooden targets for a lower price at just $40 per person. It makes sense to us for a number of reasons, primarily because it’s important we continue to uphold our cred as the best axe throwing company out there. And, since we like sharing the love, this new lower price won’t just be exclusive to wonderful Winnipeg. Soon, we’ll be rolling it out across all locations to demonstrate our commitment to you, the people who have helped us become the number one choice for axe throwing. In all honesty, we’re really excited to offer this new $40 price point and we’ve provided some very legit, awesome reasons below. We hope you’ll agree and join us for even more clear cut fun. Do we tell you enough? If not, allow us to put it bluntly: you’re simply the best. Bad Axe Throwing appreciates you, your quest for the ultimate memorable experience and your passion for unrestricted fun. Our team has enjoyed being a part of every axe throwing session, from birthday parties, bachelor and bachelorette parties, corporate events, walk-ins and of course our axe throwing league championships. We hope you like us back and with our new lower price, we’d like to see more of you. TWO: We want to be accessible. Axe throwing is a great activity for all ages and skill levels. There’s no need to have any prior steel blade throwing experience and even if your aim is a little off, we can still guarantee you’ll have a great time. We pride ourselves on offering a truly inclusive sport that brings people together. With that in mind, we wanted to make it available so that even more people can enjoy it. After all, the more, the merrier. There’s nothing better than having fun with all of your friends (even the sport-challenged).Plus, there’s a greater chance now that you’ll meet really cool people like yourself and make new friends. Axe throwing really does attract the awesome. THREE: We’re driven to be the best. When you want to be at the top of your game, you have to constantly reflect and improve. At Bad Axe Throwing, we’re always looking to do better and grow as much as we can. For us, it’s a no-brainer as a business model. That’s why we asked our Winnipeg customers to complete a survey so we could incorporate their feedback. When we’re at our best, we know you’ll have the best experience. FOUR: We want to share more Canada. 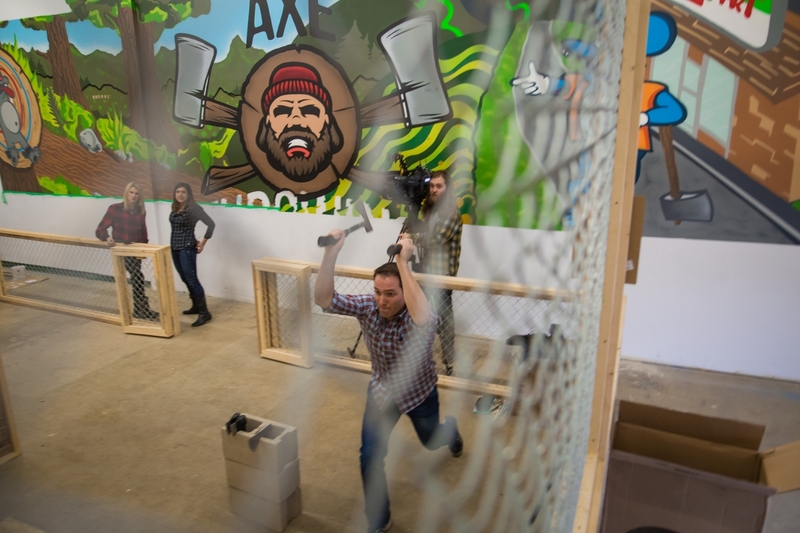 Axe throwing also goes back to our Canadian roots. Just like the lumberjacks who built our country’s timber industry, it’s a part of our identity. We know our Winnipeg customers enjoy a truly authentic experience and of course, good ol’ fashioned sports. Outside of hockey and lacrosse, we can’t think of a more Canadian sport than chucking sharp axes at a bullseye. We hope our lower price will get more Canadians experiencing a part of their heritage as well as sharing it with others. FIVE: We can’t be awesome without you. It’s a fact. Bad Axe Throwing is awesome and that’s thanks to our great customers. We’ve built the kind of company that really listens to the people it serves. So, in order for us to keep our good streak going, we need to ask how you feel about it, what could be different and what needs to be changed. Simply put, we can’t do it without you. That’s why we ask for your feedback and look to you when we evaluate how we’re doing. We learn from you and we will always strive to attain the highest level of awesome possible. All things considered, we want to make you happy, Winnipeg. You’ve been such a great city and welcomed us with open arms. It’s only right for us to show our gratitude and commitment to making Bad Axe Throwing the best at offering a truly unique experience in your city.